I do highly recommend 'Fallen Kings' to fans of this type of genre as I'm sure you'll highly appreciate it. German old-school Metallers Wizard, although a new band to me, are well-established with a long discography going back to the early nineties, with their latest album being entitled 'Fallen Kings'. Wizard have a very European old-school Metal feel to them, it's inspired by NWOBHM but is far bolder than that genre tag would suggest. They really put me in mind of Hammerfall and fellow countrymen Helloween, they also exhibit those bombastic and grandiose elements you associate with both of those bands, exuding epicness and near Operatic choruses that demand you to chant along. Wizard's song-writing and musical delivery motto seems to be the bigger the better! The similarity to Halloween is further heightened (for me) with the similarity of Wizard's vocalist Sven D'Anna to Andi Deris – it's uncanny at times. I loved 'Live Your Life' which is an obvious radio-friendly commercial track which has a great positive message and a really energizing feel to it. I felt the impact of the album dips towards the end, but the opening barrage, including 'Liar And Betrayer' and 'Brothers In Spirit', really grabbed me by the throat with their bold choruses and bombastic stance. I'm not sure why but the album features two bonus tracks which are only featured on the digi-pack version. I'm sure this is more expensive but it's well worth looking at as these two tracks, 'We Are Ready For Metal' and 'The King', are really great songs and well worth getting hold of if you can. '...Kings' is a good album, not brilliant, but I'm sure established fans will be more than happy with it. 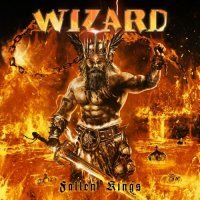 I'm also confident other old-school Metal fans who are new to Wizard will find plenty to enjoy here – just as I did! I've heard a lot bands and records in this vein over the past couple of years, due to the fact it's extremely popular at the moment, especially in mainland Europe, therefore, I have a very high standard of what I expect from bands in this genre. With '...Kings', I think Wizard are a little hit and miss, so they don't quite hit that mark where I'm screaming about the album as new genre classic even though I enjoy it. However, I do highly recommend 'Fallen Kings' to fans of this type of genre as I'm sure you'll highly appreciate it!